Moonflowers are a tropical perennial that grows as an annual in colder regions. Climbing as high as 30 feet, moonflower plants bloom when the sun goes down, releasing the large white flower's fragrance into the night air. Start moonflower seeds directly in the garden after all danger of frost has passed for the season. Score the moonflower seeds with sandpaper to speed germination. A light sanding on one edge of the large seed is all that is needed. 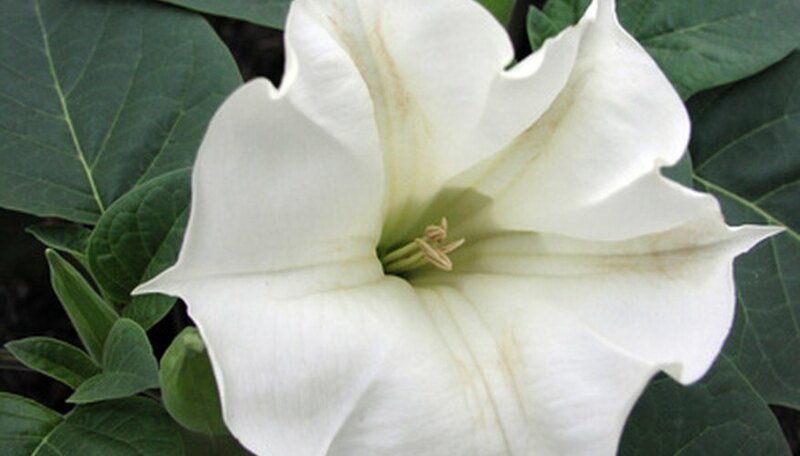 Choose a sunny location to plant the moonflower seeds. Dig up a small area of soil and add a general purpose fertilizer if desired. Set a support pole or trellis at least 6 inches into the ground for the moonflower vine to climb as it grows. Setting the pole after germination disturbs the roots and may damage the plant. Plant the moonflower seeds 1/4 inch deep. Cover with soil and water thoroughly. Wait until the moonflower plants are 3 to 4 inches tall and use your fingers to gently guide the plants up the support pole. Redirect the plants as needed every few days. Plant several plants at one time for blooms throughout the growing season. Each flower lasts only one night and dies the next morning. According to Texas A&M University, an overabundance of fertilizer results in lush foliage but few blooms.